Otter Wax is an all-natural leather care product based and designed in Portland, Oregon. Portland is a fitting place for such a product to come to light — all-natural leather care products? I would be surprised if you thought of any place other than Portland after reading those words. Boot wax by Otter Wax is an all-natural heavy duty leather sealant. As with most leather care products, the company keeps the formula very secret. Otter Wax does, at least, reveal that their Boot Wax is based around beeswax and lanolin as well as the fact that it is all-natural, so if you are looking for a non-chemical based product you have stumbled on one of the best. A test of Boot Wax in Lake Coeur d’Alene — Works like a charm! Lanolin comes from the wool of sheep, and it helps seal in moisture while also repelling water. It is a fact that is often overlooked, but leather is the skin of an animal, a carbon based organic material. So, if you were going to moisturize your own face, would you use a petroleum based product or would you use a natural moisturizer? It is a very simple answer that I am sure most of you would agree with: the less chemicals the better. It is the same story for leather care. Beeswax is a natural hydrating agent which increases moisture retention. When leather is hydrated properly, it does not absorb water as easily–it has no need to absorb water as it has enough. Beeswax attaches itself to the fibers of the leather itself and creates a long-lasting and natural bond which will repel water and moisturize the leather. Though petroleum products work, it seems to me that they would break down the fibers rather than strengthen them. I believe that you should use the same care that you would for your own skin as you would your leather. The application process of Boot Wax is incredibly simple. And, really, you don’t even need a kit. All you really need is a soft cloth and the wax itself. If you have a brush, that is great, but you can do without if need be. Before you start the process, make sure your boots/shoes are not cold. They do not need to be hot, but the process works better if they are at least warm; the reason being that leather has pores, just like our skin, and they dilate when they are warm, making the leather more absorbant. You should also have time–preferably overnight– to give the boots a chance to set properly. The wax works best when it is able to sit for 6-8 hours. Be sure to spot test, as this will darken the leather. Apply a little bit to a spot on the boot and make sure you are okay with this darkening. I personally think the leather looks better when it is properly moisturized, but it is definitely a personal preference. Rub evenly in circular motions. Get a thin layer of wax over the entire boot; go two or three times over. Get some light on your boots, so you can see what you are doing. 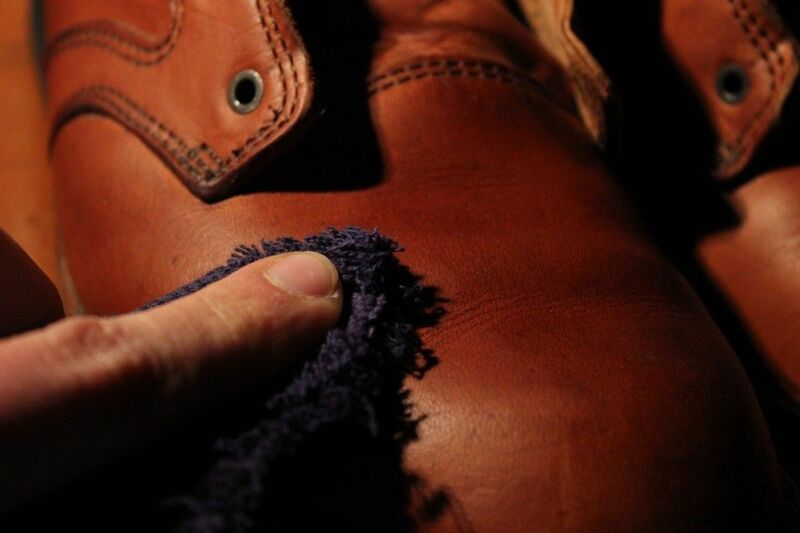 Rub your cloth in the wax and apply the wax to the boot in a thin, even layer. Rub in circular motions making sure to pay attention to the seams and welt. Two or three layers would be best. Rub off any excess wax with a soft cloth. Rub off any excess wax and then let them sit overnight, or for at least 6 hours. Be sure to leave them in a room that is at least room temperature; this allows the pores to stay open and the wax to permeate deeper into the boot. 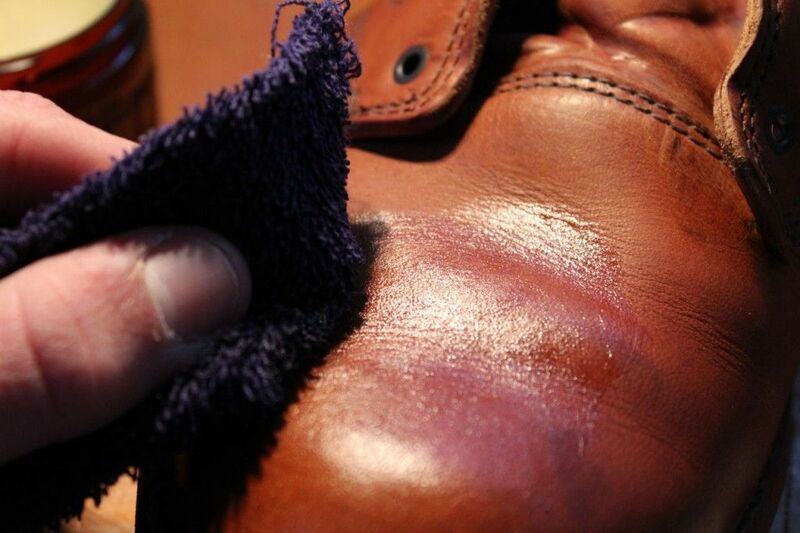 With either your cloth or with a brush, buff the leather until it is slightly shiny. This is important as it creates a final barrier between water and the leather, which will improve the water repellency of the leather. Slight color darkening — I actually like it quite a bit. Personal preference. This is by far my favorite sealant. By far. I do not feel great about applying petroleum based products to my beautiful leather products — it does not feel right. Before Otter Wax, I used SnoSeal, another beeswax based sealant, but it does not come anywhere close to the protection of Boot Wax. At $15.95 for a 4oz tin, you are getting a fantastic product that smells great, looks great, and does a great job of protecting and conditioning your leather. For $27.95, you get the whole kit and kaboodle. 5 Comments on "Boot Wax from OtterWax – $15.95"